Nitesh Patel,	The Journal of Laryngology & Otology, Volume 120 Issue 10, pp 805-807. S J Harper, N S Jones,	The Journal of Laryngology & Otology, Volume 120 Issue 10, pp 808-811. R Castano, G Thériault,	The Journal of Laryngology & Otology, Volume 120 Issue 10, pp 812-817. Should we aspirate middle-ear effusions prior to insertion of ventilation tubes? V Laina, D D Pothier,	The Journal of Laryngology & Otology, Volume 120 Issue 10, pp 818-821. Do mobile 'phones have a detrimental impact on auditory function? S Khalil, D A Nunez,	The Journal of Laryngology & Otology, Volume 120 Issue 10, pp 822-826. A S Banerjee, I J M Johnson,	The Journal of Laryngology & Otology, Volume 120 Issue 10, pp 827-831. H Sudhoff, D Brors, A Al-Lawati, E Gimenez, S Dazert, H Hildmann,	The Journal of Laryngology & Otology, Volume 120 Issue 10, pp 832-836. R Syal, H Singh, K K Duggal,	The Journal of Laryngology & Otology, Volume 120 Issue 10, pp 837-841. 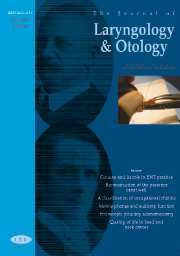 J Doshi, Y Karagama, D Buckley, I Johnson,	The Journal of Laryngology & Otology, Volume 120 Issue 10, pp 842-844. D M El-Hennawi, A S Abou-Halawa, S R Zaher,	The Journal of Laryngology & Otology, Volume 120 Issue 10, pp 845-848. A Tsikoudas, X Kochillas, G Vernham,	The Journal of Laryngology & Otology, Volume 120 Issue 10, pp 849-852. S J C van der Avoort, N van Heerbeek, G A Zielhuis, C W R J Cremers,	The Journal of Laryngology & Otology, Volume 120 Issue 10, pp 853-856. R Fernandes, P Gopalan, C Spyridakou, G Joseph, M Kumar,	The Journal of Laryngology & Otology, Volume 120 Issue 10, pp 857-860. Why are head and neck cancer clinicians not measuring quality of life? H M Mehanna, R P Morton,	The Journal of Laryngology & Otology, Volume 120 Issue 10, pp 861-864. A Yakirevitch, Z Horowitz, D Simansky, L Bedrin, J Kronenberg, Y P Talmi,	The Journal of Laryngology & Otology, Volume 120 Issue 10, pp 865-867. J Hill, S Carrie,	The Journal of Laryngology & Otology, Volume 120 Issue 10, pp 868-869. T Udaka, H Yamamoto, T Shiomori, T Fujimura, H Suzuki,	The Journal of Laryngology & Otology, Volume 120 Issue 10, pp 872-874. A Sethi, D Sethi, S Mrig, J C Passey, N Srivastav,	The Journal of Laryngology & Otology, Volume 120 Issue 10, pp 875-878. D Tam, L Francis, C Perry, A Thirwall,	The Journal of Laryngology & Otology, Volume 120 Issue 10, pp 879-881. Failed tracheostomy under local anaesthesia…plan B? B Maiya, H L Smith,	The Journal of Laryngology & Otology, Volume 120 Issue 10, pp 882-884. U Hofmann, J P O'Connor, C S Biyani, P Harnden, P Selby, P M T Weston,	The Journal of Laryngology & Otology, Volume 120 Issue 10, pp 885-887. F Forli, M Mancuso, A Santoro, M T Dotti, G Siciliano, S Berrettini,	The Journal of Laryngology & Otology, Volume 120 Issue 10, pp 888-891. I Moumoulidis, R De, R Ramsden, D Moffat,	The Journal of Laryngology & Otology, Volume 120 Issue 10, pp 892-895. E Flook, S SriKumar, M Johnston,	The Journal of Laryngology & Otology, Volume 120 Issue 10, pp 870-871. The Journal of Laryngology & Otology, Volume 120 Issue 10, pp 896-897. The Journal of Laryngology & Otology, Volume 120 Issue 10, pp 1-4. The Journal of Laryngology & Otology, Volume 120 Issue 10, pp 1-6.